We remain in New Rochelle’s far northern end. Like Abbey Close, Abingdon Lane is also in Scarsdale Downs, but on the other side of Baruad Road. Sometime between 1884 and 1893, the farm was acquired by Wellcome G. Hitchcock, the president of a large and well-respected dress goods importer (W.G. Hitchcock & Co.). 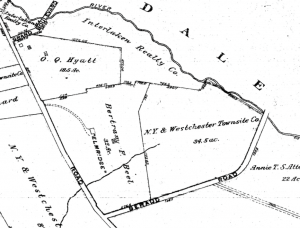 Hitchcock had amassed vast land holdings (around 1500 acres) in Scarsdale, Hartsdale, and to a lesser extent, New Rochelle. But when his business failed — by all accounts abruptly — a company called “Scarsdale Estates” was formed to dispose of the land to satisfy Hitchcock’s creditors. 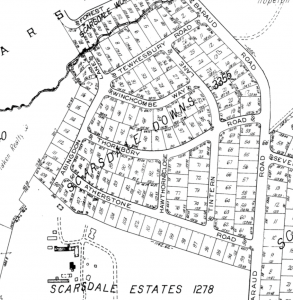 In the early 1900s (possibly 1904), the land was split in half — the southern end remained a farm — but the northern end was acquired by something called the “New York & Westchester Town Site Company.” “Town-site” companies were often (if not always) associated with a railroad. 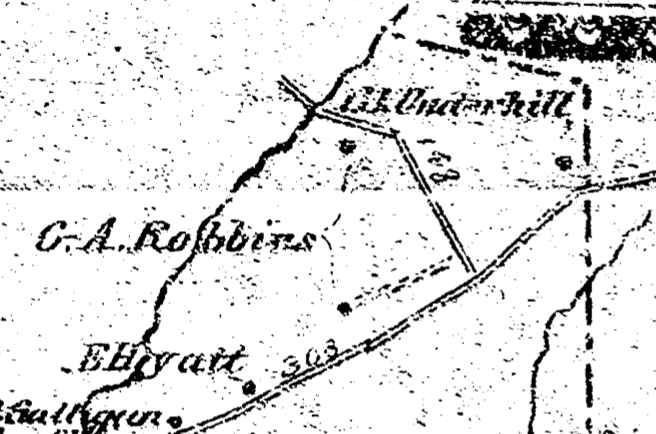 The railroad would plot a course and then buy up the land in the surrounding areas in a speculation play. 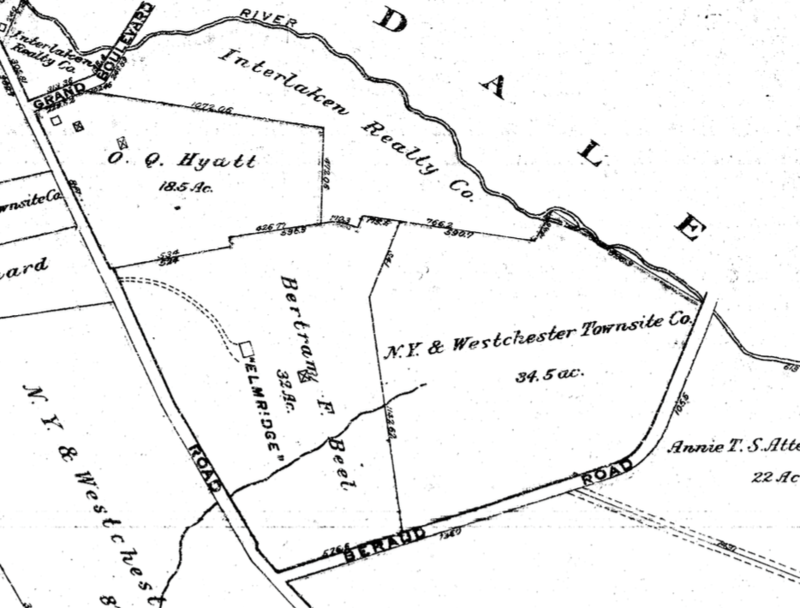 The N.Y. & Westchester Townsite Co. appears to have been associated with J.P. Morgan’s N.Y., Westchester, & Boston Railway, a defunct commuter railroad that connected the Bronx to Westchester County. By all accounts, the N.Y.W. & B. was precisely what one would expect from a railroad backed by J.P. Morgan — a magnificent and efficient enterprise. 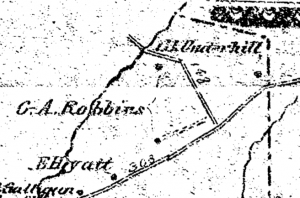 The old Robbins farm land did not abut a station directly, but it was fairly close to the Heathcote station, which was located at Palmer Avenue and Heathcote Road in Scarsdale. The railroad declared bankruptcy in 1935. As described in the post for Abbey Close, Scarsdale Downs was developed in the 1920s. 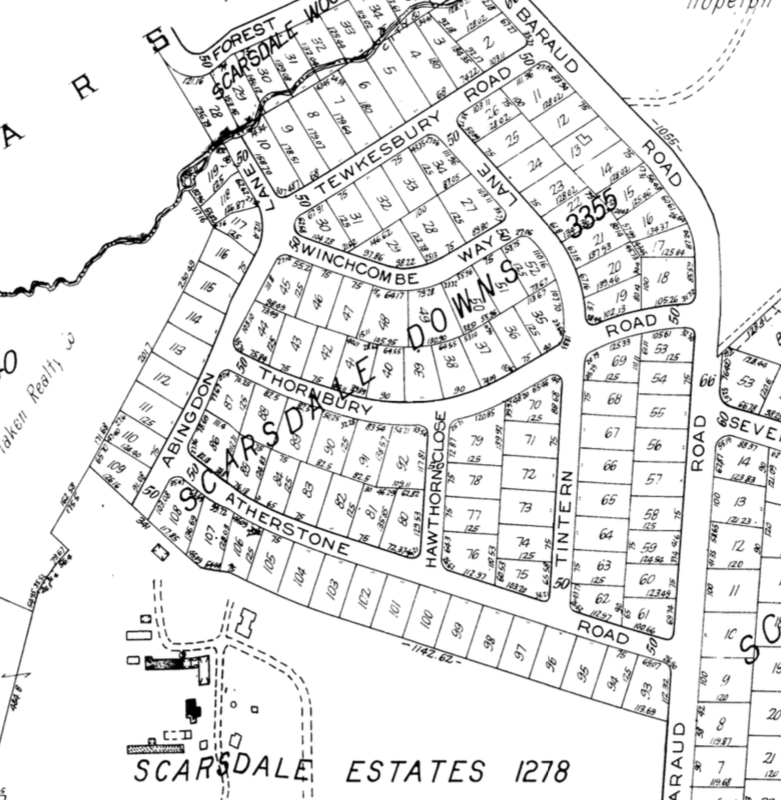 Plans were filed with the County for a proposed water pipe extension for Scarsdale Downs, including Abingdon Lane in 1929. Like Abbey Close, the street name, Abingdon — the village in England where Martha Washington’s ancestors lived — connoted English gentility, or at very least colonial respectability.